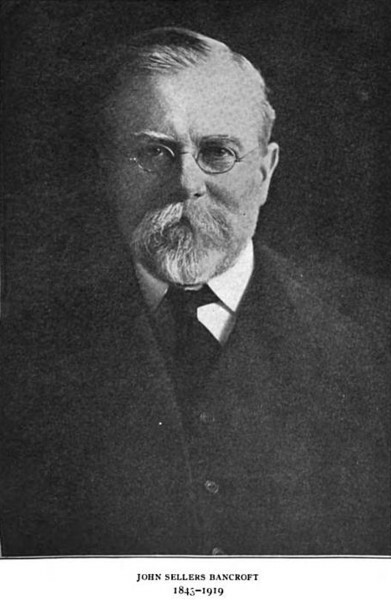 John Sellers Bancroft, member of the Franklin Institute since 1865, died January 29, 1919, after a lingering illness. He was the son of Edward Bancroft and Mary Sellers Bancroft and was born in Providence, R. I. September 12, 1843. His father, who will be remembered as the inventor of the " Ball and Socket Hanger," operated a machine shop in Providence, R. I. in partnership with his brother-in-law, William Sellers, making lathes, planers, drill presses and specializing in shafting and mill gearing. In 1848 Bancroft & Sellers removed to Philadelphia and in 1855 were located at Sixteenth and Hamilton Streets. On the death of Edward Bancroft, John Sellers, Jr., was admitted to partnership and the firm name was changed to William Sellers & Co.
John Sellers Bancroft graduated from the Central High School in 1861 and became an indentured apprentice in the machine shop of his uncles in that year. He applied himself so assiduously to his duties and developed so much ability that he was made a gang foreman in his nineteenth year and upon completing his apprenticeship, in 1864, was appointed foreman of the machine shop. Two years later, at the age of twenty-three, he became general foreman of the whole establishment, including foundry and smith shop.He was admitted to partnership in 1873 and upon the incorporation of the firm, in 1886, he was elected a director and general manager. In 1902 he resigned to associate himself with the Lanston Monotype Machine Company as mechanical engineer and manager and later as vice-president and treasurer. He became a member of the American Society of Mechanical Engineers in 1880, was a manager 1900-1911, and a vice-president 1915-1917. During his long connection with the Franklin Institute he does not seem to have held any office; but he was much interested in its work and served on many committees. About 1861 his firm introduced into the United States the Giffard Injector for feeding boilers. This was not only a new device but its manufacture required the development of a proper system of methods, tools and fixtures; and in establishing and developing this work, Mr. Bancroft was largely instrumental. Later he concerned himself earnestly with the improvement of the instrument and conducted or directed the tests and experiments upon which the improvements were based. Perhaps the most conspicuous achievement of his later life was the perfection of the Lanston Monotype Machine. It came to him scarcely more than an ingenious mechanical toy, frail, unreliable and difficult to construct. He superintended its redesign to facilitate its manufacture, located one by one its weak spots, devised corrections, made improvements and developed a system of manufacture which produced a thoroughly practicable substantial machine of much greater scope and capacity than the original: and from a partial failure he evolved a great commercial and mechanical success. Mr. Bancroft was a mechanic of unusual ability and a fertile versatile inventor, as is attested by the large number and great variety of patents which bear his name. He had high mechanical ideals and strove for the best in method and workmanship. As an executive officer he was a strict disciplinarian, was careful and thorough, and gave close attention to details.